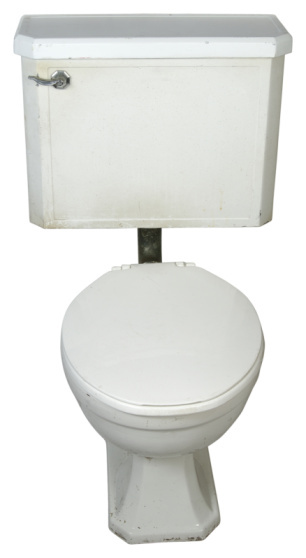 You find float valves in well systems, in sump pumps and, of course, in toilet tanks. The concept behind the float valve is simple. A buoyant ball or cup rides on the surface of the water in a pit or container and activates a valve or switch when the water level reaches a predetermined limit. Look inside your toilet tank, and you will see an air-filled ball connected to a stem or rod that is in turn connected to the fill valve. When you flush, the float falls with the water level, the stem opens the fill valve and water starts pouring into the tank. The float rises with the water until a certain point when the stem forces the valve to close, and the water stops. That's a classic example of a float valve. A float switch works by the same principle, but instead of a valve, the float stem activates a switch that actuates a pump. The purpose of the pump could be to fill a tank, as on some well systems, or it could be to empty a pit, as on a sump pump. In a sump system, the switch is wired to turn the pump on, not off, when the water rises. If you want to understand how a float valve works, you don't have to look beyond the toilet mechanism in your bathroom. Lift the lid, flush the toilet and then support the ball float so it doesn't fall, and note that the water stays off. Lower it a little, and note how water sprays out – a little at first and then more and more as you let the ball fall farther into the tank. That's the reverse of what happens when the tank is filling. The float stem is connected to a spring-loaded valve that wants to stay closed, but the force exerted by the arm when the ball drops opens it. You can adjust the water level by adjusting the length of the arm, and you do this by screwing or unscrewing the ball. Some well systems employ a ballcock-style float valve or float switch to keep a holding tank full. When the water in the tank falls below a preset value, the float arm actuates the pump in the well, which is connected by a length of wire. The pump operates until the float reaches the pump's cut-off point. What's Inside a Float Valve? The ball float and float arm are easy to see, but the actual float valve is hidden inside the valve housing. If you could look inside with X-ray vision, you would see one of two mechanisms: a slide valve or a diaphragm valve. A slide valve consists of a cylinder that slides along a horizontal track. In the closed position, the cam attached to the float arm forces it against the water inlet port to block water. When the float drops, it pulls the piston away from the port and allows water to flow. A diaphragm valve works in a similar way except that a rubber diaphragm takes the place of the sliding cylinder. This type of valve usually has a screw that allows you to adjust the tension on the diaphragm to increase or decrease the sensitivity of the valve to the motion of the float arm. Tightening this screw forces the ball valve diaphragm closer to the water inlet and forces the valve to close sooner.